Deep Diver 90 series.View Here. 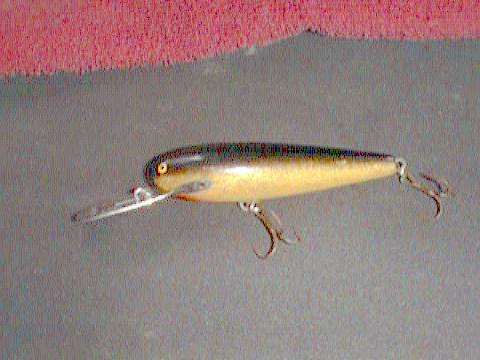 One more metal lipped Rapala Deep Diver. This is the larger of this series. It's stamped of the lip "Rapala Deep Diver 90 Finland"
This is the larger of the series and is stamped on the metal lip, "Rapala Deep Diver 90 Finland". Lure is marked in black print "Finland" on the belly. The lip has the clear writing. 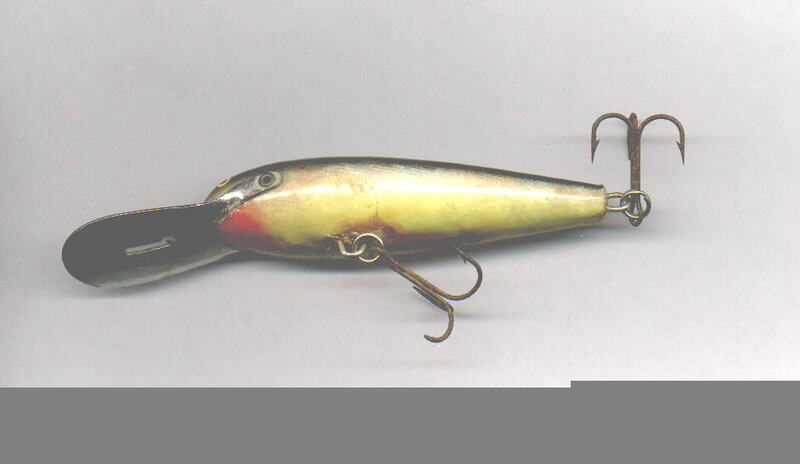 Lure is marked "Original Rapala" on the lip and "Finland" on the belly in black print. 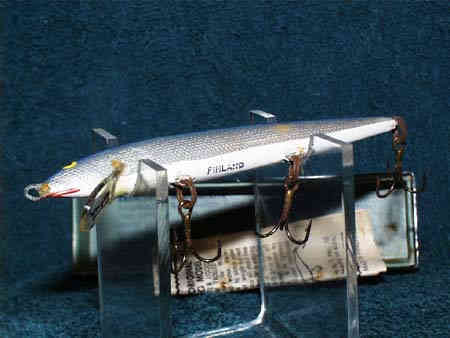 Lure is marked in black print, "Original Rapala" on the lip and "Finland" on the belly. Original Floating 13 G Kulta Gold ITB. 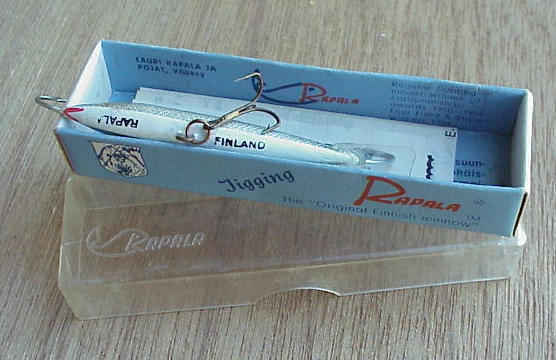 These 2 lure's are marked "Original Rapala" on the lip and "Finland" on the belly in black print. 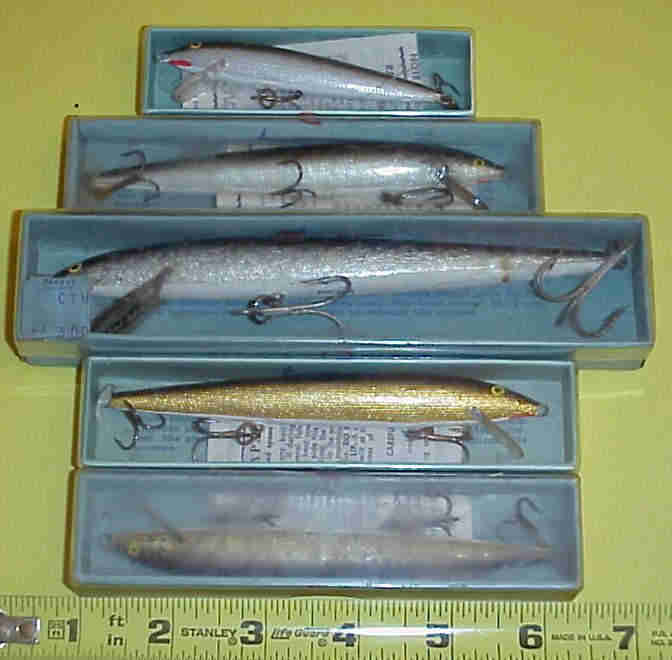 All the box's in this set have the end plate displaying the Rapala "Fish" Logo. 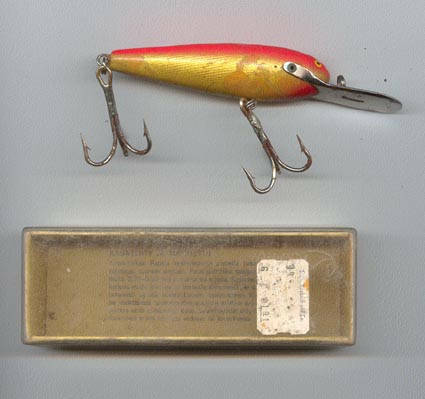 A floating Rapala in what the catalog lists as color pattern Blue Mullet (later changed to just Blue) It's got both the belly and bill marks in black print. 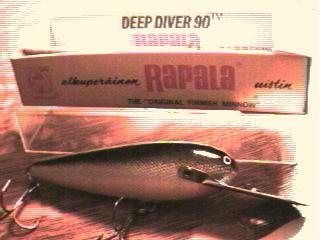 The box is in good condition and has the Rapala "Fish" logo on one end plate. The newest addition to the collection. Another of the Deep Diver series. It has the marked metal bill. This is the first one in my collection that also has the box. As I look it over and get more info, I'll update this listing. 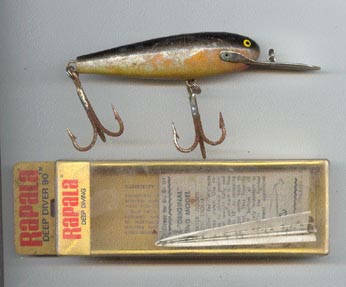 Rapala Deep Diver Series. View Here. Just when I thought the lure hunting was going slow. I was able to get another one of this series. It is mint, in the box. It has the metal bill with the markings. It also has the paper insert. Rapala Deep Diver 90 View here. This Deep Diver is in the GFR (gold/fluorscent red) color pattern. It is also in the box. A very nice addition to my collection. A very Interesting Rapala lure. It is in the box and has the paper insert. The top has the rapala 'fish' logo molded into it. The lure itself has a flat plastic tail unlike those of later years that are angled. It also has in black print on the belly, Rapala and Finland. Thanks Sis for adding this to my collection. More lures can be found on the next page.